Writing a resignation letter to the organization where you have spent a good amount of time working may be difficult. You may not gather the best words and feelings to construct the letter. Also writing a letter in a hurry may not be possible for all. You may not be well acquainted with the writing styles and may look for guidelines and references. 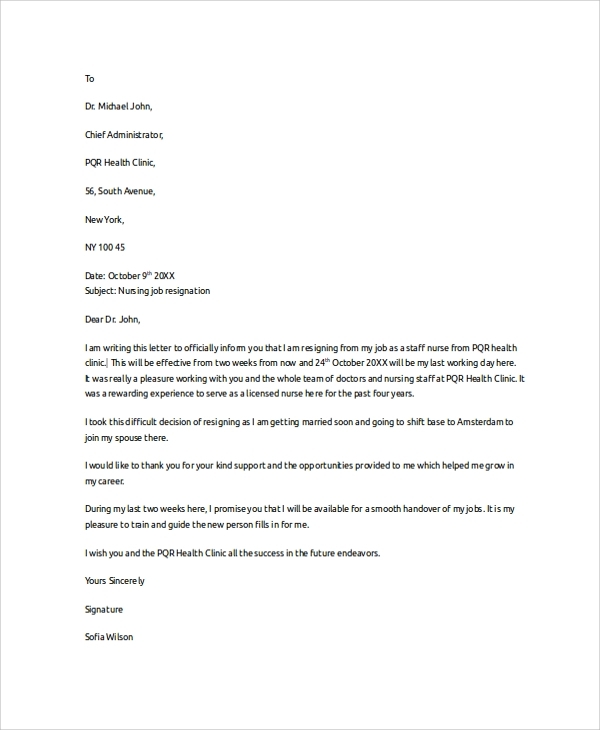 Hence the Sample Resignation Letters are of particular help for all those, who have the slightest confusion regarding the letter format, or have no time to think and write, etc. 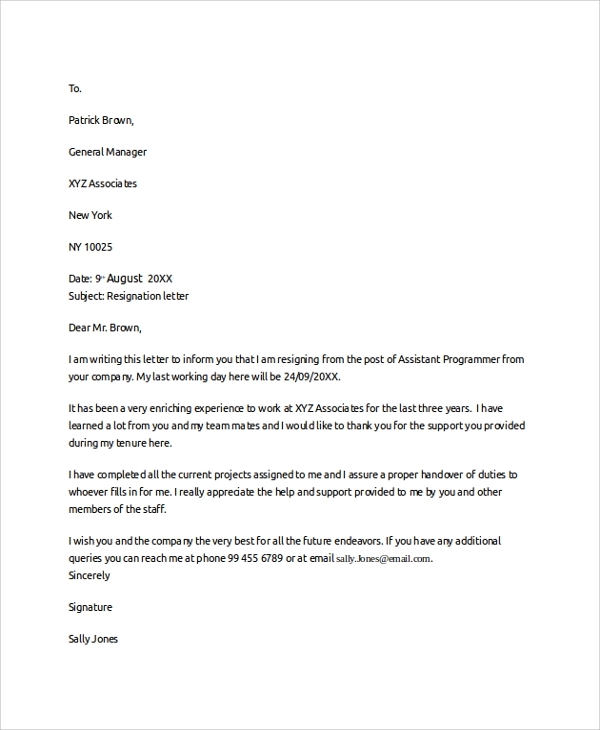 The example of a professional resignation letter format is available here. This will give you an excellent idea of putting together words and facts professionally to resign. 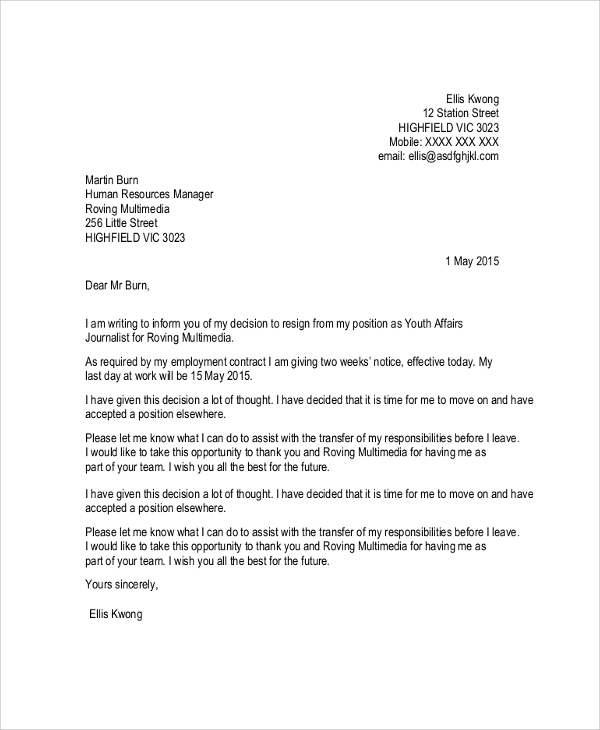 This resignation letter example email is all about expressing the resignation on email. This letter format is for those, who would not provide a handwritten letter and rather resign by mailing online. Nurses would find this resignation letter format especially helpful. As they are not much into writing, and spends most of the time in medical facilities, hence they would like to avail a ready format for official resignation in this sample. The two weeks notice resignation letter is what you would love to use when you resign with specifying a two weeks notice period. This format can be fitted into any domain for resigning purpose. This format is the best when you simply need ideas. 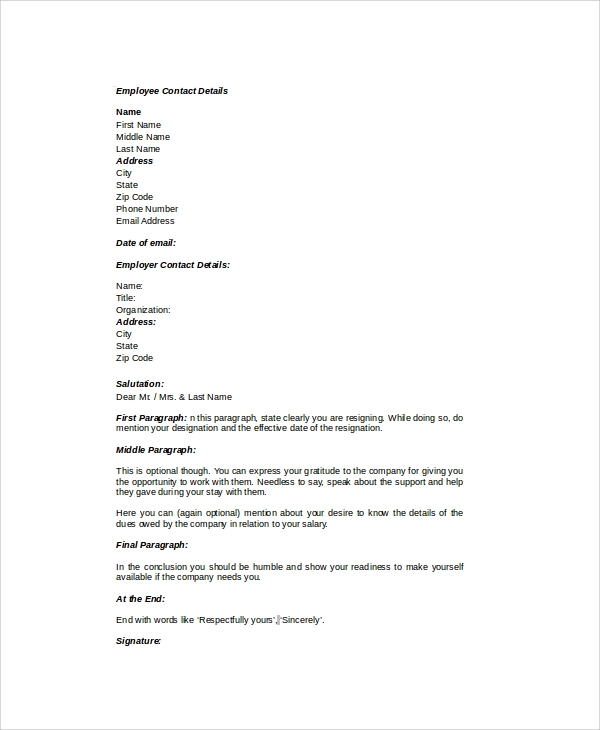 The example stated shows how to leave in a standard and official style, and anyone can use this format and personalize it with their particulars and details to suit. 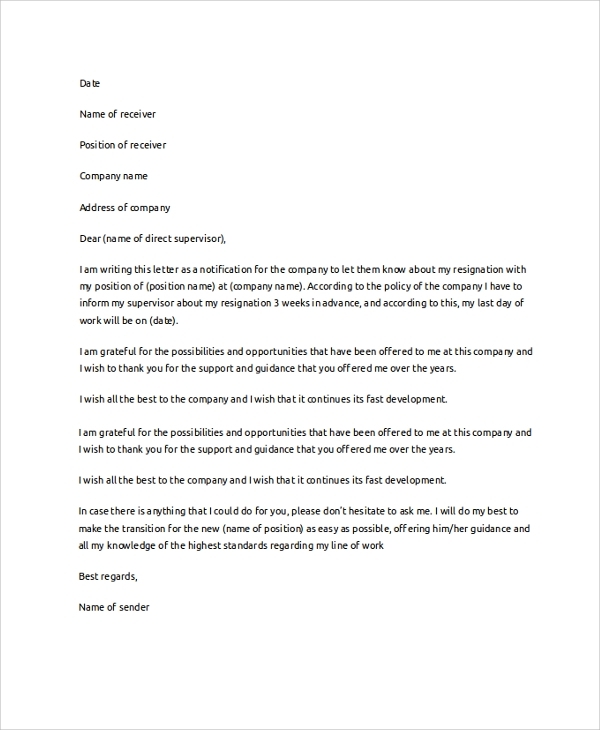 There are some values which you must enter in a Resignation Letter Format. Like when you intend to resign, what is the notice period, how do you want the last settlement of receivables to be made, what assets of the company you have which you want to return, etc. Especially when you are resigning, there has to be a reason, and this reason is mentioned in the letter. 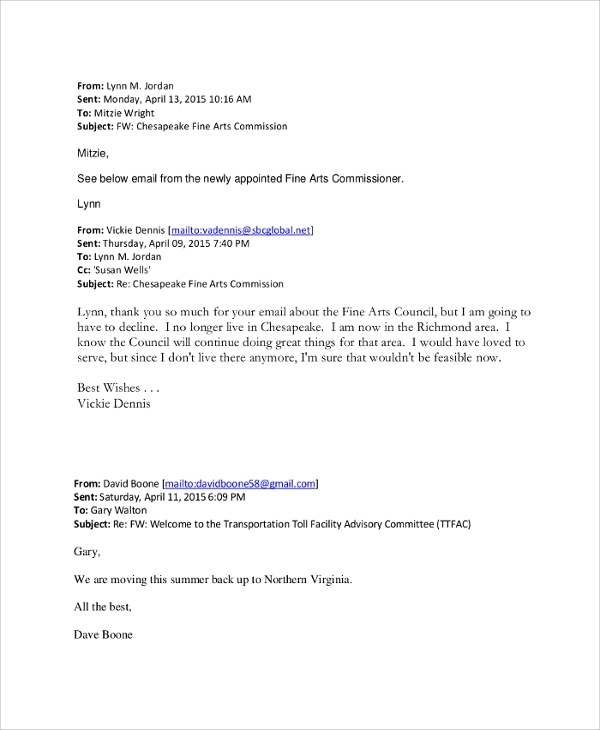 With this information, closely and neatly woven into beautiful words, and formatted into an official pattern, the resignation letter is prepared. And then it’s presented to the higher authority in the office or the recruiter to tell that you want to discontinue your services. 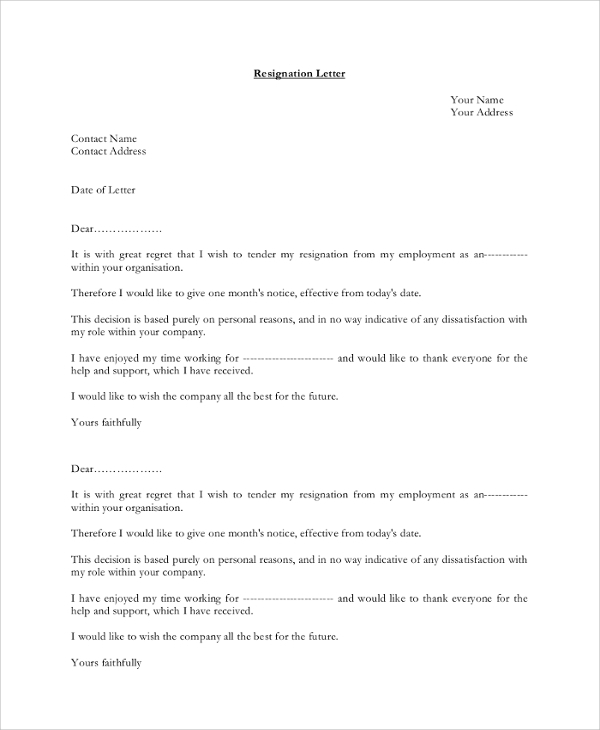 A resignation letter is the proper official way to tell your organization or recruiter that you want to terminate your services by giving proper notice. When you mention your concerns, your requests, and demands, etc. 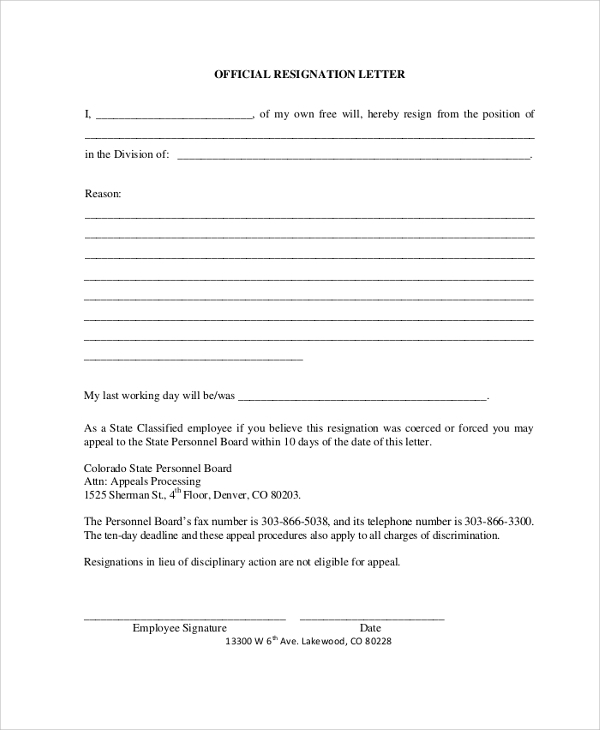 in a resignation letter, and get it received officially by the authorities, then you make one form of official record, which you or your recruiter may refer to anytime to resolve disputes, refer to details, etc. Thus, there is a tremendous importance of a Professional Resignation Letter. That is why when you write it, you have to write it in an appropriate official tone. As you can see here, there are useful samples of various resignation styles. Each one is made to fit an industry, domain, a job role, etc. Now it’s on you that you use a particular style, or rather use a generic one and customize it. You can use them free of cost, and just directly customize with your details and print.